Once a year, a boy and a girl from each district are selected by lottery and sent to the Capitol as punishment for a failed rebellion. Twenty-four enter. One survives. Katniss Everdeen doesn’t need the Hunger Games to make her struggle for survival; every day is a battle to overcome severe poverty and starvation. Since her father’s death, she’s done everything she can to keep herself, her mother, and her younger sister Prim from following him, but when Prim’s name is called at the Reaping, there’s only one more thing she can do. 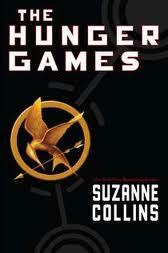 But the Hunger Games are about far more than surviving, and she’s in far more danger than she realizes. The Games are just the beginning. At first glance, this is a book that seems brutal, and make no mistake, it absolutely is. But what makes it particularly brutal isn’t what we initially think, and that’s what makes it truly brilliant. Katniss as a narrator is complicated, largely because she’s not particularly complicated as a character. Her motivations are simple: survive, and keep her family alive. That’s it. That is the sum of Katniss Everdeen’s goals in life, and it’s the entirety of her focus. Her attention is narrowed to what will keep her family alive, so she doesn’t tend to notice the bigger picture. She doesn’t notice people who aren’t directly linked to her family’s well-being, or at least doesn’t give them much thought. She’s solitary, awkward, and so much of her energy is put to surviving that every other emotion, every other reaction, is buried. As a narrator that becomes problematic, mainly because her stoicism and her determination to just get through things- in other words, to be stronger than her mother- can create a flat affect that distances us from what’s going on around her. In one sense, this is a necessary conceit of a narrator- no matter how overwhelming and emotional a scene, the narrator can’t break down because his/her words are what carries the story. In another, though, it’s hard to invest in her as much as we’d like to, because even as she builds a wall between herself and the rest of the world, she keeps us on the other side of it as well. Still, she’s a solid character, strength with deep vulnerabilities, a good heart tempered by bitter experience and an inability to trust other people’s motives. We root for Katniss because even though she’s had a crap life, she hasn’t ever given up. No matter how bad it’s gotten, no matter how much she’s had to struggle, she’s come through it. That determination, that deep well of strength, is amazing, and the way she looks at people- the way she pares people and things down to the most essential aspects with little more than a glance- is a mark of a survivor. This is a world of extremes, pitting the excesses of the Capitol against the deprivations of the outer-lying districts. We see some of the best humanity has to offer, as well as some of the worst. We see what pure adrenaline can do, as well as pure despair. And we see how we become conditioned by the atmosphere in which we’re raised. It seems horrific that people in the Capitol can gleefully watch the games year after year, that they can look forward to it in any way, and it is- but that part shouldn’t be surprising. We know very early on that this is the 74th Hunger Games- most of those alive in the Capitol have never known a time without the games. They’ve been literally raised in them, the ultimate in cultural desensitization, and they’ve never had to face the threat of anyone they know being in them. They’ve been raised to believe that it’s right- worse, that it’s natural- and that informs their worldview. What makes this book terrifying- which it is at its best points- isn’t the violence, or the kids killing kids. It’s that it doesn’t seem as far-fetched as we’d like it to be, and that’s not at all a comforting thing. You see these reality shows and most of them are harmless, but then you have people competing for extreme plastic surgery. You have people starving themselves on islands or in deserts or jungles. You have people putting themselves in extreme danger and risk of imminent death for a few minutes of fame and glory. So what happens when they feel the need to go just a little further, do a little bite more to boost the ratings? In the Capitol, in the Games, we have the ultimate falseness of reality television, all the more striking when put against the severe deprivations of true reality in the outer districts. This book is the Roman circus brought into our current sensationalist mentality. This book shows that when you put enough effort into manipulating the appearance of something, eventually you lose the ability to discern between the truth and the created facade. But it’s also proof that appearance is a powerful tool, if double-edged. It’s about making choices, about deciding who you are and who you want to be, about what you stand for. It’s about deciding the face you want to show to the world- and then deciding how much of that face is truth. But most of all, it’s about the difference between surviving and living.